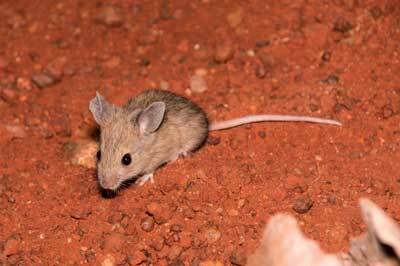 The Plains Mouse (Pseudomys australis) is a moderately sized rodent, with a stocky build, rounded snout and long ears. It has greyish upperparts, often lustrous in appearance, with paler flanks and cream or white underparts. The tail is also bicoloured being brown or grey above and white underneath. This species is nocturnal and forms shallow burrows in clay. Listed as vulnerable because, although the species has a relatively wide range, its area of occupancy is less than 2,000 square kilometres, its distribution is (and populations are) severely fragmented, and there is continuing decline in the extent and quality of its habitat in south-central Australia due to grazing. It is one of the largest rodents still present in the arid zone with a body mass up to 50g. The tail length is usually less than head-body length. Females give birth to a litter of usually between three or four young after a gestation period of between 30 and 31 days.